Electric fireplaces add beauty and warmth to any room. They are terrific for family rooms, bedrooms, home offices, or any place where you could use a little more heat. Many models are framed in wood with stone or brick accents that give the look and feel of a traditional fireplace. Realistic flames and embers add to the illusion, while the heating elements keep your space toasty warm. Contemporary versions can be wall-mounted for a crisp, clean look, and those that imitate the appearance of an old-fashioned wood stove will be charming in any country setting. 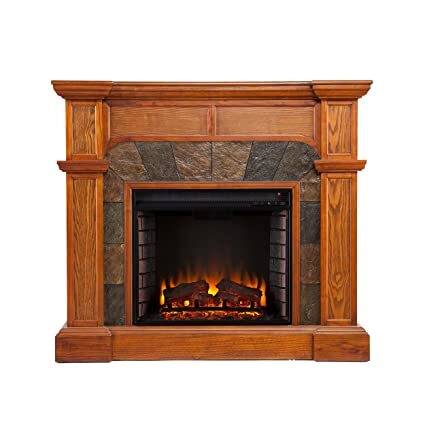 The Touchstone Onyx Electric Wall Mounted Fireplace is a beautiful piece that will add to the décor in your family room, living room, or any other space where you can take advantage of the realistic flames and warm heat provided by this 50-inch electric fireplace. You will be able to enjoy this contemporary, black framed electric fireplace without the soot and smell of a real one. 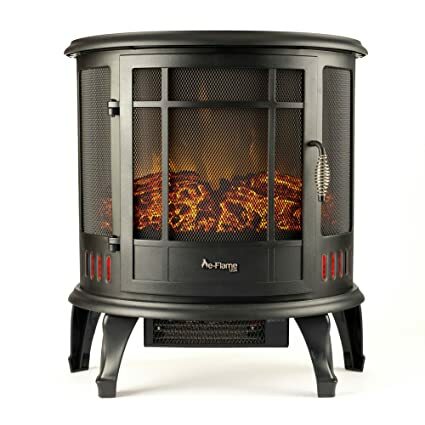 It has two heat settings, and it can keep any room measuring up to 400 square feet toasty warm. This electric fireplace’s flame can be used without the heat. This means you can have the look of a working fireplace any day of the year. The Touchstone Onyx Electric Fireplace is simple to install. It comes with complete instructions to help you with each step of the installation process. Once it is mounted on your wall, you will be able to enjoy five flame settings that range from glowing embers to a full fire. Each setting is controlled with the remote control so that it is easy to change the flames according to your mood, room lighting, or desired effect. The heat can also be controlled with the remote control as well as from the side of the electric fireplace itself. It comes with a built in timer. This setting will automatically shut off the heat anytime from30 minutes to 7 ½ hours. The Touchstone Onyx Electric Fireplace can easily be mounted without any help from others. The exclusive mount bracket from Touchstone is included in your purchase. The unit may also be recessed back into the wall. Simply hang the bracket on your wall, place the electric fireplace on it, and then use the screws to keep it secure. The manufacturer recommends hanging it at least 24 inches down from your ceiling. Many people like having it mounted 24 inches below their wall mounted TV. This electric fireplace uses 1500 watts/5100 BTUs with its two heat settings. It measures 50.4 by 5.5 by 21.6 inches, and it weighs 46 pounds. It is manufactured in China, and it is constructed of metal and glass. The Touchstone Onyx uses an AC power source and has an LED bulb in it. The power cord is six feet long so that you will have some flexibility in where you place it. The heat from this particular unit is forced forward through the heat vent. This means that the heat won’t cause any damage to the wall behind the electric fireplace or to the paint surrounding the piece. The top of the unit can feel very warm to the touch, but it is not hot enough to burn you. It is still best not to set anything directly on top of this electric fireplace. When the heat is off and the flame is all that is working, no heat is created. If the unit was to overheat, it will automatically shut off. Make sure that the heat disables switch on the back of the electric fireplace is on before using it. 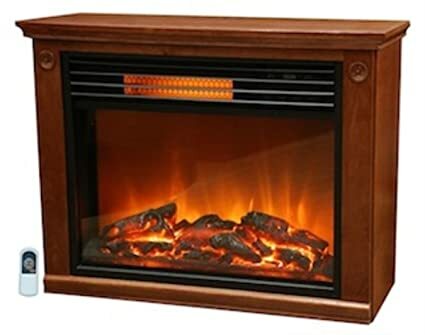 Online reviews rate this electric fireplace as a very good value. Installation takes less than 15 minutes, and it only requires a stud finder and a drill. Owners describe it as mesmerizing once they have it mounted and the flames turned on. The flames are quite realistic. They provide a stunning scene during night time viewing. Many people like that the flames can be used without the heat being turned on. This is especially appealing to anyone looking for the ambiance of a real fireplace during the warmer seasons. This electric fireplace is perfect for the bedroom. Those that already own the Touchstone Onyx Electric Fireplace appreciated the timer feature which allows them to take the chill off of their bedroom without worrying about falling asleep. It is the perfect size for any room under 400 square feet, and it provides ample heat to keep you warm on chilly nights. The Lifesmart Large Room Infrared Quartz Electric Fireplace can be used anywhere in your home because no venting is required with this unit. You can have the warmth and beauty of a real fire without the soot, smell, or expensive installation. This particular electric fireplace has an attractive oak mantle and surround that fits in nicely with many styles of home décor. Unlike many of the other models on the market, this electric fireplace is an actual infrared heater that can handle large spaces easily. It includes three quartz commercial grade infrared elements that create a soft and cozy heat. The Lifesmart Infrared Quartz Electric Fireplace uses no more electric than your hair dryer. It is perfect for zone heating because it will only use 1500 watts. It can be plugged into any standard outlet rated for 15 amps and 110 volts. A manufacturer’s one year warranty covers all of the electric components. E-Z glide castors are found on the bottom of this design so that it can easily be moved from place to place. The flames in this unit mimic the way real flames dance so that you have a realistic fire that will add to the beauty of your home. The adjustable flames can be used with or without the heat so that the electric fireplace can be enjoyed throughout the year. When the heat is being used, a scroll fan quietly circulates the warm air. A large remote control comes with this model so that you can operate the electric fireplace from across the room. It includes two heat settings. The Lifesmart Large Room Infrared Electric Fireplace measures 11 by 29 by 23 inches, and it weighs 43 pounds. It is manufactured in China. A thermostat is included in the design of this piece so that you can set it for your desired room temperature. It will only come on when the room’s temperature drops below your desired setting. The fan creates a slight hum when it is running, but it is not loud enough to distract you. This electric fireplace is safe to use around children and pets. The glass on the front of it remains cool to the touch, but the upper vents where the heat comes out can get quite warm. The heater can be used without the flames being turned on and vice versa. You can easily enjoy the look of the flames on days when the temperature is warm. It can safely be placed on carpet, and it comes to you fully assembled. Online reviews describe this electric fireplace as a good value when it comes to space heating. The flames are fairly realistic, and many people like that it comes with a thermostat. Those who purchased this model warn prospective buyers to pay close attention to the product’s dimensions. It is a bit on the small size. This makes it perfect for bedrooms and small spaces. The castors are an excellent feature that leads many people to give this electric fireplace a high rating. The Cartwright Oak Convertible Electric Fireplace from Southern Enterprise comes with natural earth tone simulated stone that enhances the look of the oak mantle and the surrounding. The panels all feature realistic wood grain patterns, and the crown molding is accented with the sleek columns found on each side of the component. It can be placed flat against the wall or across the corner for versatility in decorating your room. The flames in this electric fireplace come in a multi-color, realistic look. They flicker across the glowing embers inside of a brick interior that creates a lifelike image. The size and style make this electric fireplace perfect for living rooms and dining rooms as well as bedrooms and home offices. You can easily install the piece yourself, and it features an LED light for energy efficiency. The LED lights also offer you the option of downlight illumination. The Cartwright Oak Convertible Electric Fireplace features a remote control that allows you four-way adjustability to keep your room warm. This remote will control the timer, thermostat, flames, and logs separately. Once your desired temperature is reached, this electric fireplace automatically shuts off. Other safety features include the cool to the touch glass front which makes it ideal for around children and pets. This electric fireplace can heat areas that are up to 400 square feet, and it can be used without the heat for ambiance. It will easily hold a flat panel TV with a width up to 43.25 inches. The unit can be plugged into any standard wall outlet, and the six-foot cord allows you plenty of freedom when deciding where to place it. The Cartwright’s specifications include temperature ratings of 62 to 82 degrees found among four-degree intervals. The flat version measures 45.5 by 15.5 by 40.25 inches while the corner option is 45.5 by 26.5 by 40.25 inches. The firebox on the front is 23 inches wide by 20 inches high. It weighs roughly 116.5 pounds, and the mantel can support up to 85 pounds. Product materials include polyresin, poplar, veneer, metal, MDF, glass, and resin. It is manufactured in China, and some assembly will be required. The quartz heat can handle up to 400 square feet. The fan has a hum to it, but most people say that it is not a loud and distracting noise. The fan will automatically shut itself off when your desired temperature is reached. The flames have a golden amber color, and they can be adjusted for different effects. When the flames are turned off they will slowly fade away to add to the realism. It is easily converted from its flat wall version to a corner electric fireplace by opening the drop leaf on the back of the unit. Its versatility makes the electric fireplace easy to decorate with. Online reviews rave about this electric fireplace’s appearance. The slate and wood finishes look spot on, and the flames can be adjusted to match whatever ambiance you are trying to create. The unit is extremely sturdy. Those that own this particular electric fireplace state that it is not at all flimsy. They can move it around with confidence when decorating. The switches that are located on the piece are hard to reach, but this keeps children from being able to play with the settings. Any adjustments that need to be made on a daily basis can be easily accessed with the remote control. The Regal Electric Fireplace stands out among the other designs due to the fact that it is created to look like a vintage wood stove. This creation from e-Flame USA recreates the classic front of a heat stove complete with dancing flames. With this modern take you won’t have to be concerned with chimney fires, messy ashes, or costly fuel. You only need to find the perfect spot for it, and plug it into any standard outlet. It is ideal for sunrooms, family rooms, the home office, or any other location where you need a little more heat. The Regal Electric Fireplace comes with a fan forced heater that can help you reduce your current heating bills. It is designed with a realistic black matte finish along with chrome highlights just like the wood stoves we remember from our past. The powerful heater can handle up to 400 square feet while staying cool to touch. This makes it the perfect option for those with small children and pets. The electric fireplace can also be used without the heater for ambiance. All of these features come in a small package that doesn’t take up a lot of space in your home. The high and low heat settings allow you to heat your room evenly. It only costs around eight cents per hour to operate, and the special 3-D effects add to the flame’s realism. It measures 12 by 25 by 22 inches, and it weighs 27.1 pounds. It has the appearance of cast iron, but it is constructed of plastic, lightweight metal, and resin. The fan has a slight hum to it when running, but it doesn’t bother most owners. Online reviews state that this electric fireplace offers above-average value for the price. The curved front makes it look very realistic. The doors can be opened so that you can view the flames from the sides. The lightweight construction feels sturdy, and minimal assembly is required. The four legs will need to be attached, but other than that, you will simply plug it in. The only complaint is a loud ticking noise when running. This is easily fixed by opening the back panel of the unit. A long piece that spins in order to create the look of a flame often comes loose during shipping. Once this is set back into place the noise stops. You will need to know if the best electric fireplace you choose will fit in the space you have available as well as be able to heat the entire area efficiently. Take measurements to determine the square footage of your room you want to heat. Many of the electric fireplaces will use between 700 and 1500 watts and produce between 4,600 and 9,600 BTUs of heat. One that uses 1500 watts of power will be able to heat spaces that measure up to 800 square feet, while those using 700 watts are more suited to an area of 400 square feet. Electric fireplaces are most likely to have an infrared quartz heating element or forced air fans. Rather than simply heating the air, infrared fireplaces transfer radiant heat out into the room where you and objects in that space are warmed. This makes these versions ideal for large areas where you are most likely to lose heat. Forced air units use a fan to circulate the warm air away from the heating coils and into the room. These work nicely in small spaces or as an addition to a central air system. Regardless of which heating element you choose, be sure that your system can manage a 110 to a 220-volt heater. Take into consideration the price of installation as well as the operation when budgeting money for the best electric fireplace. Many versions will seem affordable at first glance, but make sure that they can heat your entire space while being energy efficient. Plug-in models and freestanding units are usually ready for use directly out of the box. This eliminates installation costs, but they are a bit more expensive to purchase. The average electric fireplace will cost you somewhere between seven and thirteen cents per hour to use. Compare these figures to the 20 additional cents it will take to use a gas heater. No matter what model you select, electric fireplaces can be a money-saving compliment to the heating system you already operate. Make sure that the installation process will fit nicely into your lifestyle, budget, and available space. Corner models and the small plug-in units are excellent for apartments as they do not require the landlord’s special permission. They are also easy to move from one room to another. Electric logs and fireplace inserts can be purchased to be used in an existing fireplace in order to add beauty to space as well as heat. If you don’t have an electric fireplace, there are many electric fireplaces available with beautiful wood mantels, framing, and shelving. They can become a wonderful centerpiece to any room. If you actually own your home, you can select a built-in electric fireplace. These are hardwired into your house by a professional. The electric fireplace is a great way to showcase your personal style. Many versions have a display mode where you can enjoy the look of flickering flames and glowing embers with the heat turned off. This is wonderful for creating ambiance on warmer days. Wall mounted units add a beautiful focal point to any contemporary area, and those that mimic the look of an actual fireplace and mantel are charming when placed on a flat wall for a more traditional style. Units that allow you to change the color of the flames to suit your mood will add whimsy to your space, and those that incorporate shelving for your TV, electronics, books, and media help solve your storage issues as well as your heating requirements. Special features make an electric fireplace attractive as well as inviting while being simple to operate. Flame displays allow you to enjoy the look of fire all year long, and many units will have speed, brightness, and color adjustments for them. Thermostats let you regulate the temperature of a room. These are often operated with remote control, and they give you an excellent energy-conscious way to heat your room. There is an electric fireplace to suit every style of home décor. Any contemporary home will benefit from the Touchstone 50 Inch Onyx Electric Wall Mounted Electric Fireplace. Its modern design will give your home warmth and beauty throughout the year. The Lifesmart Large Room Infrared Quartz Electric Fireplace is a compact unit housed in a traditional Oak fireplace surround. It will warm up to 400 square feet while giving the illusion of a real fire complete with flames and embers. Those looking for an exquisite showpiece for their room will want to look no further than the Southern Enterprise Cartwright Oak Convertible Electric Fireplace. This beauty is accented with slate stones and fits just as nicely into the corner as it will against a flat wall. If you are looking for more of an old-fashioned approach to heating, try the Regal Electric Fireplace with its wood stove design.